As a restaurant owner, there are certain things you need in order to help ensure your establishment runs effectively and efficiently, such as the right doors. Keep in mind, your kitchen swinging doors reflect what customers envision on the other side, so replacing your existing swinging doors with more appealing doors, just may increase customer traffic. Restaurant doors, such as cafe doors, allows owners to personalize their restaurant traffic door to match their decor, while also providing some much needed separation and protection from wandering patrons. Cafe doors, similar to saloon doors and gate doors, are swinging doors that separate potentially hazardous, industrial, or “employee only” areas of your restaurant, such as the kitchen, from the general population. What are the Features and Benefits of Cafe Doors? Cafe doors differ from other swinging restaurant doors in that they provide a more aesthetic appeal, which is just perfect for areas where you simply want to create a visual separation. 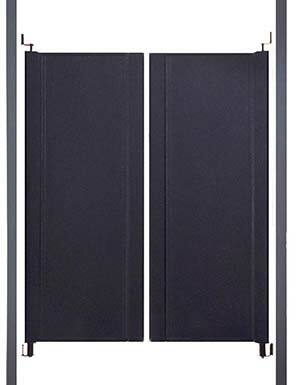 All cafe doors come equipped with XL Ultra Soft Touch Hinging System, an industry standard. The XL Hinge is undisclosed in the rear spine, so it eliminates unattractive parts or cutouts for a more sophisticated design. In addition, the hinge allows for extra wide opening, which reduces damage to the jamb. Some models also include a gravity assist hinge system, which helps the door close instantly. Cafe doors are ideal for potentially hazardous areas where customers or small children may wander and harm themselves. What are Different Types of Cafe Doors? Cafe doors can be custom made to fit the exact width and length of your individual entryway, and existing inside finished frame openings are fitted with doors and hardware to accommodate any gaps. Frames can also be purchased separately. Your restaurant doors can also be purchased in a variety of colors, if choosing high pressure laminates.